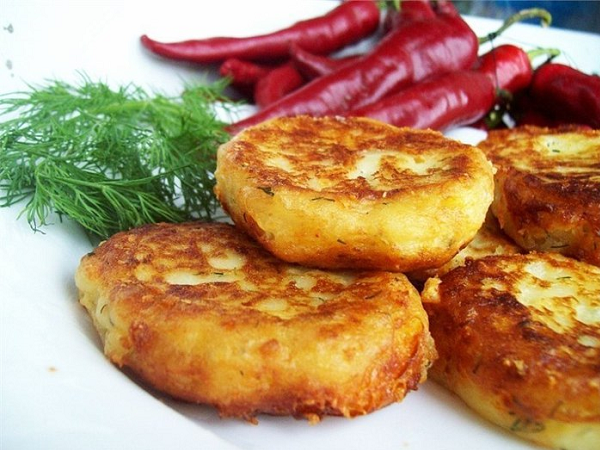 Hearty and incredibly tasty patties of mashed potatoes is a full – fledged separate dish, it is useful to which will except that sweet sauce. Prepare them with different toppings – green onions, cheese and dill, or pour a thick mushroom gravy. Peel the potatoes, cover with cold water and cook until tender. Crush the soft tuber of the special pressure or immersion blender. Chopped onion together. Heat the vegetable oil and fry the greens for 2-3 minutes on medium heat. Shifting it to mashed potatoes, mix well and salt to taste. Let the mass cool slightly, then shape the patties and roll in breadcrumbs. Fry them on both sides until zolotisty. Grate cheese. Chop the dill, after cutting off the hard stems. Whisk the egg with a fork or whisk and mix with the cheese shavings. Add sour cream, flour with baking powder, chopped herbs and put in the mashed potatoes. Stir everything thoroughly until a uniform distribution of components, pepper and sunflower. Make the meatballs from the masses, give them an oval or round shape and fry in a large portion of vegetable oil. Pat patties of mashed potatoes thick with a paper towel to remove excess oil. Put the softened butter and eggs in mashed potatoes, stir, and season with paprika, salt and crushed garlic. Whisk in a small bowl of milk with soy sauce. Heat vegetable oil in a frying pan. Dial 1,5-2 tbsp potato pulp, give her hands desired shape, dip in milk mixture, coat with breadcrumbs and place in pan. Iriarte all the meatballs and cover them with the lid that slowly cools down. Boil the mushrooms, drain in a colander, saving the broth and finely chop or mince. Melt the butter in a saucepan, sprinkle in the flour and fry it, then a thin stream pour the Cup of broth, continuously stirring the mixture to avoid formation of flour lumps. Enter in mushrooms, cream, sprinkle nutmeg and salt. Cook gravy until thick, pour over cutlets and serve immediately.